You know when a small project turns into a big one? That's kind of what happened to us this week. 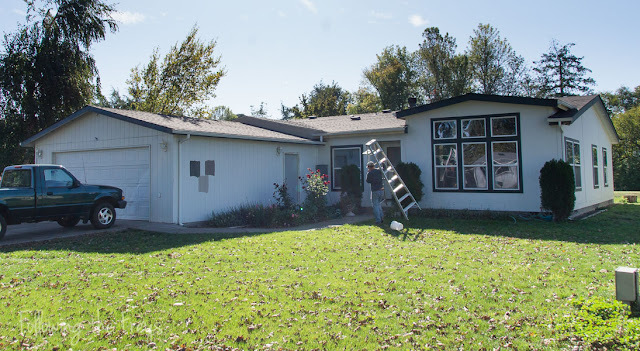 All summer long we have known that there were some fascia boards that had been replaced on our furlough house that had not yet been painted, and that they needed to have paint applied before the fall rains started. We put it off until now, when we realized that it really was getting quite late and we'd better get on it. Well, after a lot of indecision, we decided to go ahead and paint the whole house... it was due for a new exterior coat. So that project has dominated our week. Here it is before painting, although after washing, sanding and prepping. 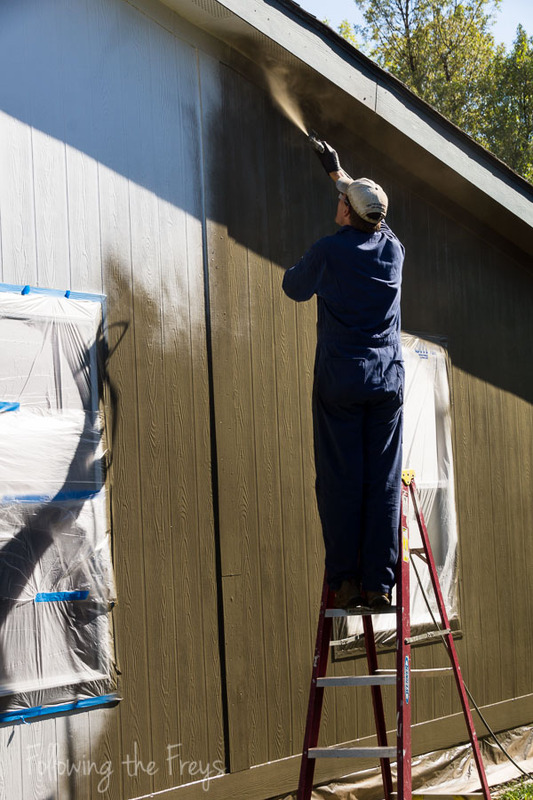 You can see some color samples on the side of the garage as we tried to decide on a color. 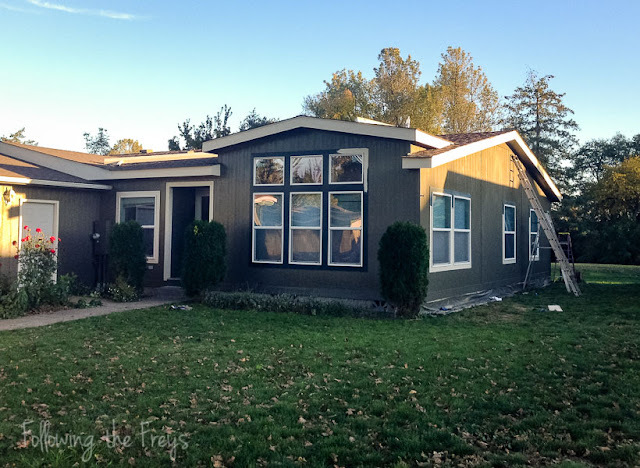 And we decided that we might as well completely change the color scheme, from white with very dark teal trim to a dark "griege" with cream trim. We were able to borrow a paint sprayer, and as you can see, Brian just went to town with it. Here is where we are at the end of today, with some help from Brian's parents. The color is the kind that seems to change colors depending on the light, so I'm not sure this photo is a good representation of it. It's a brown that sometimes looks grey and sometimes looks a bit green. 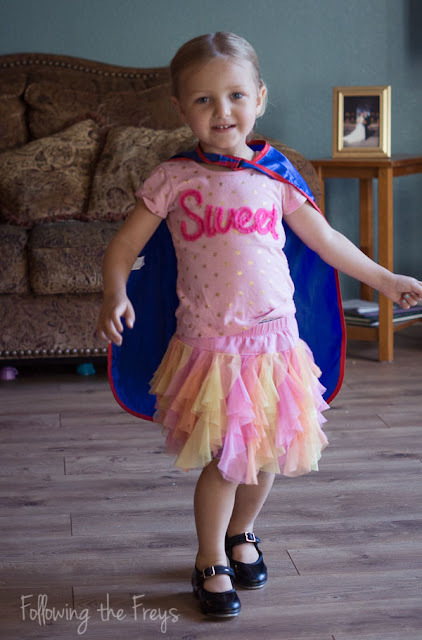 Twirling skirt, pigtails, tap shoes and a super hero cape. The girl knows how to make an entrance!